Sad News: We lost contact with Bergen. His PTT has missed three scheduled uploads and I have no data points since February 13. It’s a complete mystery. He was in an area where he has been several times before. His last data points were all perfectly normal and he was moving around normally with no sign of anything unusual; then nothing; not even a weak non-GPS signal; just nothing. 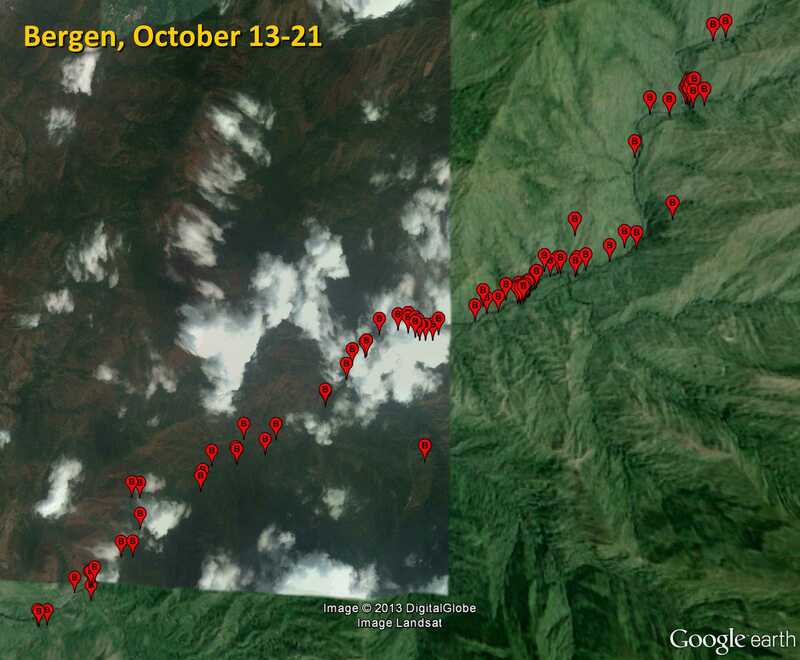 We always try to be optimistic and hope that perhaps unusually cloudy weather has prevented the solar cell from charging the battery, but deep down we know that something drastic most likely happened to Bergen and the PTT. It’s unlikely that we will ever hear from Bergen again. 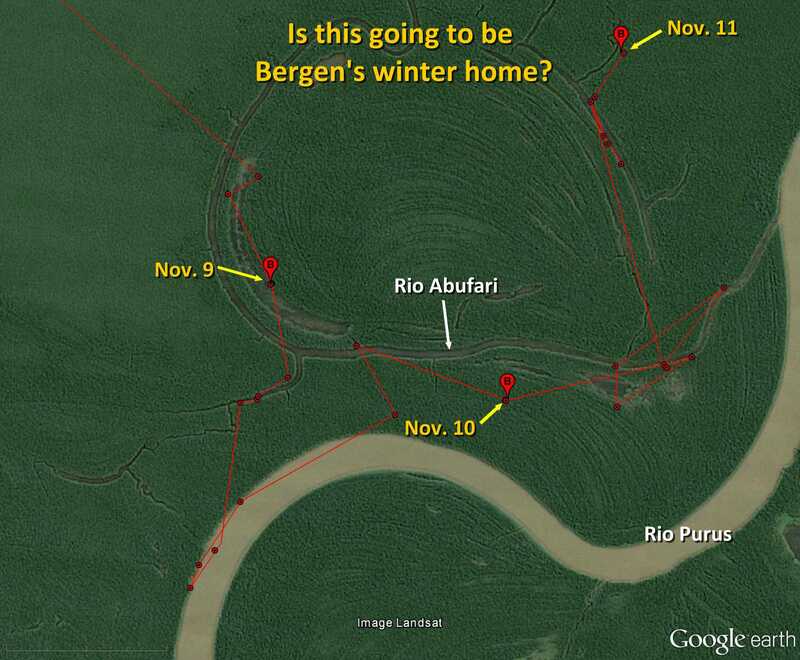 Bergen visited Lago Jari -- a large “lake” 50 miles east of his usual spot -- for a couple days but has now returned home on the Rio Purus. There must be something in the air (see Artoo’s update), Bergen too went for a little wander. He took a 100+ miles round trip to the south, leaving on Sunday and returning on Tuesday. He’s now back in his usual territory. Nothing much new from Bergen or any of our New Hampshire birds. All settled and quiet. 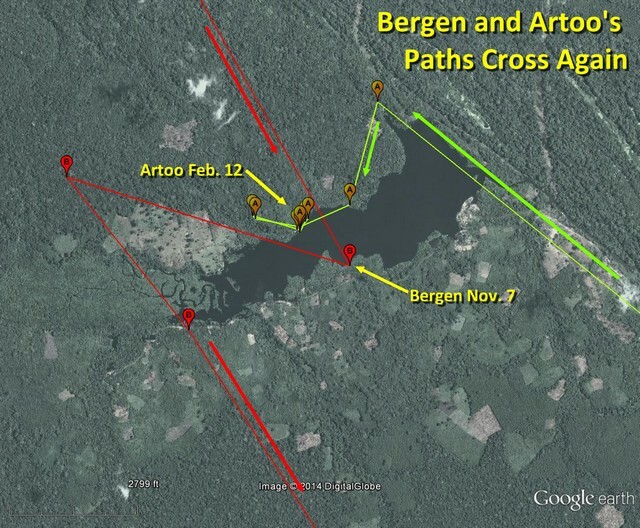 This map shows the current known locations of 15 Ospreys being tracked right now with PTTs. 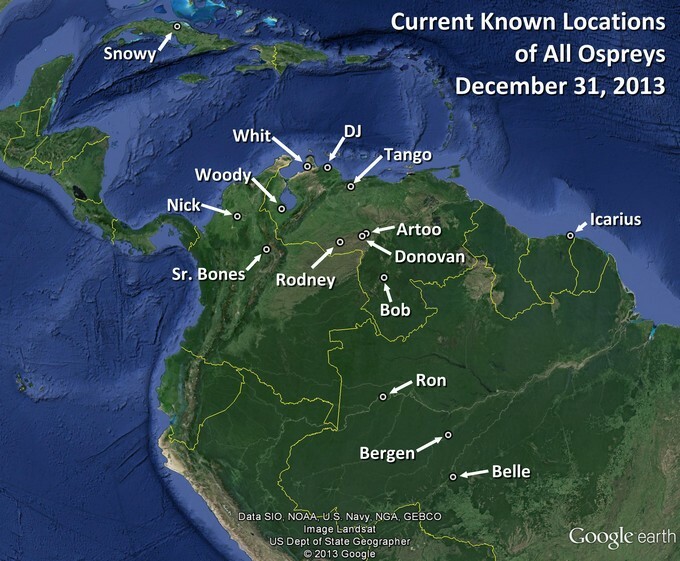 The three juveniles (Artoo, Bergen, and Whit) will stay down in South America throughout 2014, but the other 12 (all adults) will return to North America in March/April. It’s going to be a busy spring. Bergen went for a little wander about again, exploring some new wetlands to the west and south of his core territory. 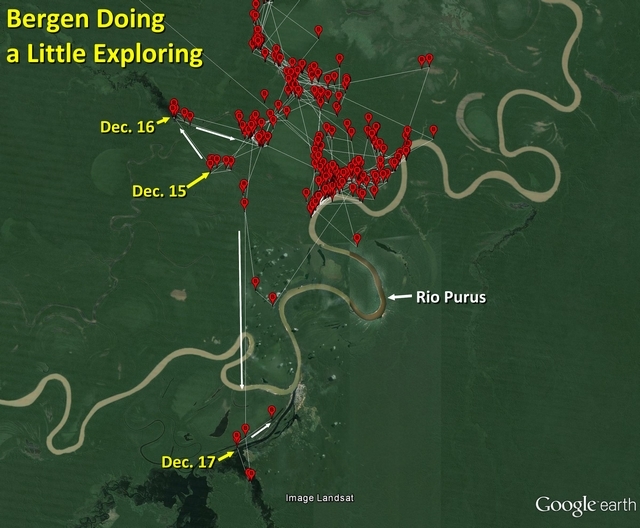 On the 17th he was visiting a large flooded section to the south of the Rio Purus. He’s only about 20 miles from his main site. Checking out the neighborhood and getting to know if the grass is greener on the other side of the river. Bergen is doing a little exploring in the Rio Purus watershed. 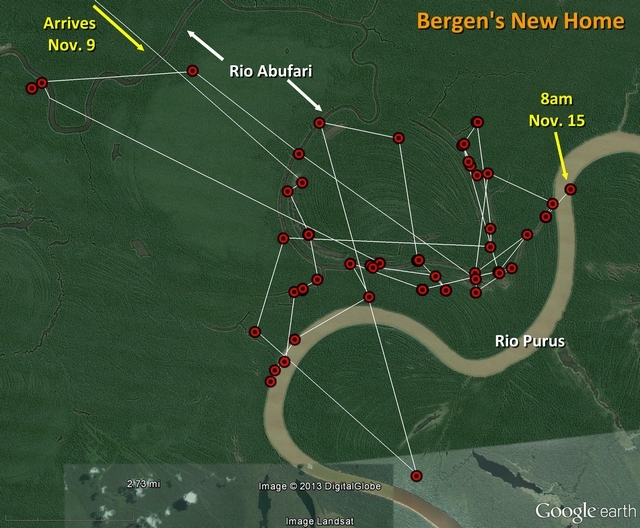 After a loop around to the north on November 22-23, he returned to the Rio Abufari and for the last several days has been hanging out in a small area just a little to the north-east of the main channel of the Purus. He is in such a rich and remote natural area. There is no sign of human occupation or activity here, just thousands of acres of virgin rainforest. Bergen is exploring his new home. The map shows all his points since he arrived here on the 9th. The latest point is from 8am this morning when he was on the main trunk of the Purus River. This looks like a really good place for him and he is looking very settled. Bergen has found a new home (for now at least). 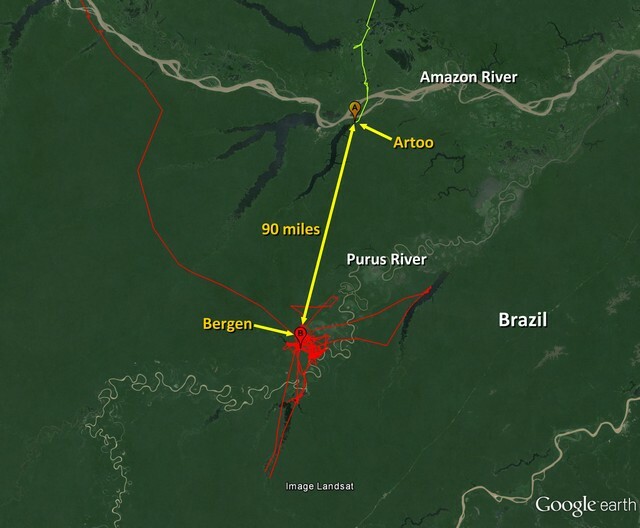 On Saturday he arrived at a lovely spot near the Rio Purus, well south of the Amazon in the Tapaua region of Brazil. 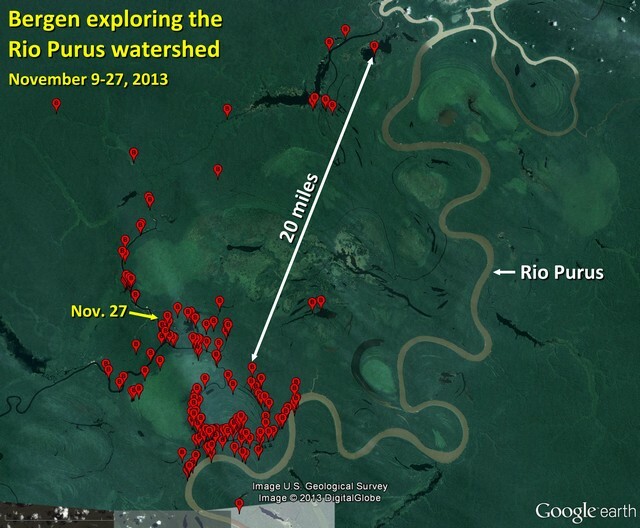 He’s spent time since then on the main trunk of the Purus and along the smaller Rio Abufari. He’s now 2,000km from his river hangout in Colombia and has reached the exact latitude as his father Art’s winter home on the Rio Tocantins. This looks like a lovely place to stop . . . for an 18 month vacation. 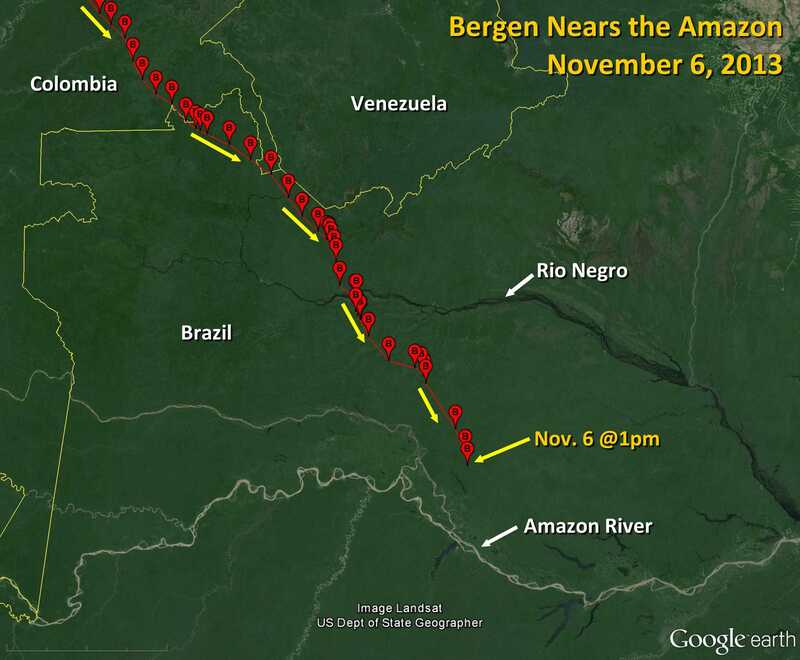 Bergen is nearing the main branch of the Amazon River. He crossed the Equator on the 4th and is now deep into lush Amazonian rain forest. His detailed data shows that on Sunday he did not quite slip back into Venezuela as I suspected, but paralleled the border while remaining in Brazil. Bergen has kicked into high gear again and is pushing further south. 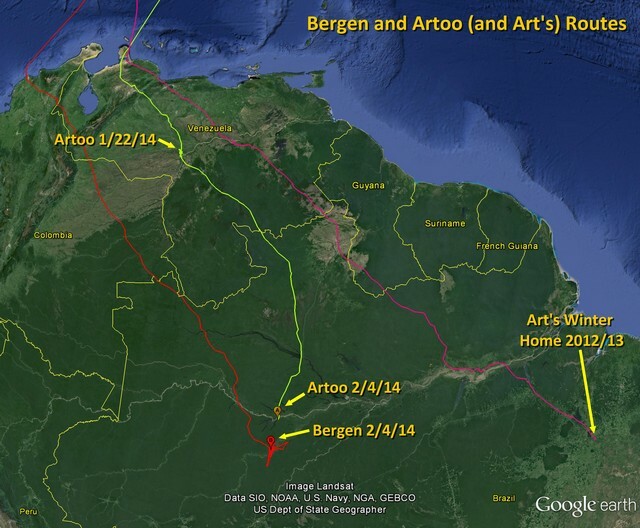 By Saturday evening he had travelled through eastern Colombia and roosted for the first time in Brazil. The next morning he was on the move again and looked to have a three-country day (back into Colombia, then into Venezuela and likely back into Brazil by the end of the day). He has paced himself and should be well rested. It’s been 75 days since he left New Hampshire and in that time he has actively migrated on about 31 day. On those migration days he has travelled a little over 4,000 miles. 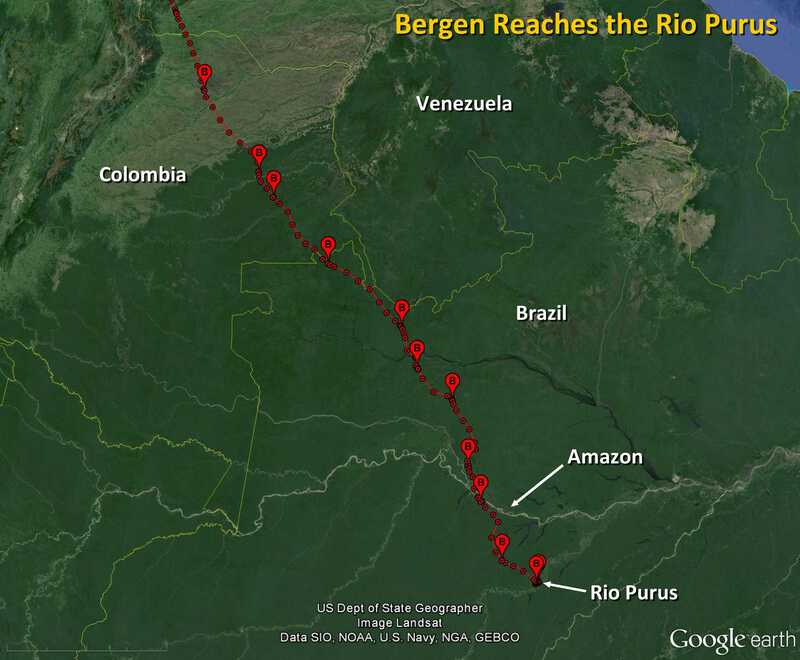 Bergen has made good progress over the last few days and has moved more than 330 miles since leaving the Rio Sicarare. He made quick work of going up and over the Sierra Nevada mountain range in Venezuela. At one point he was over 12,000 feet up. 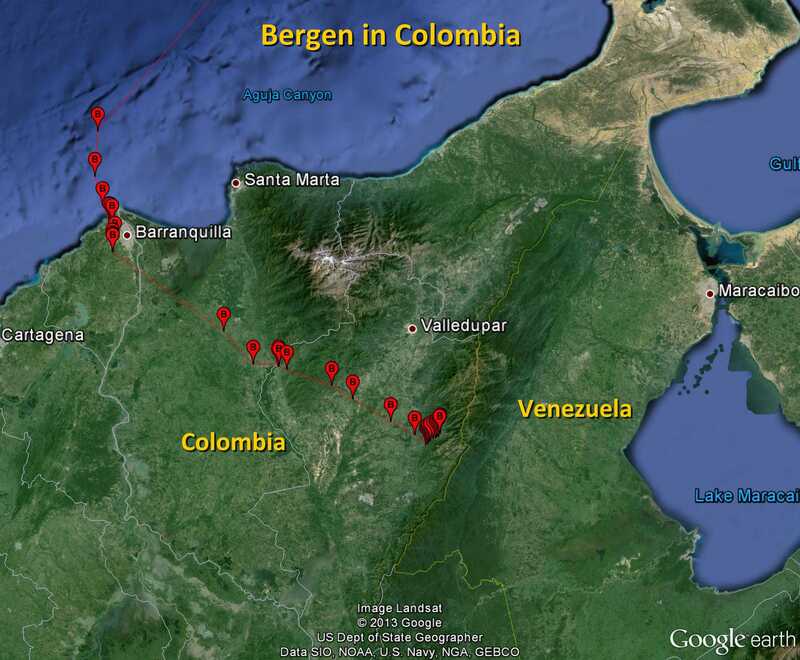 He is now cruising into the north-west edge of the huge Orinoco watershed and back in Colombia. 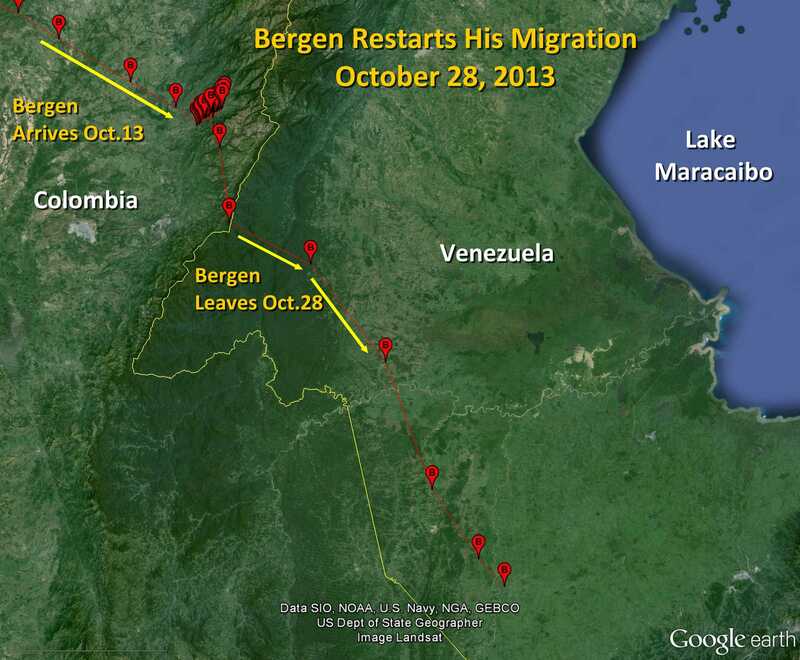 Bergen resumed his migration yesterday. 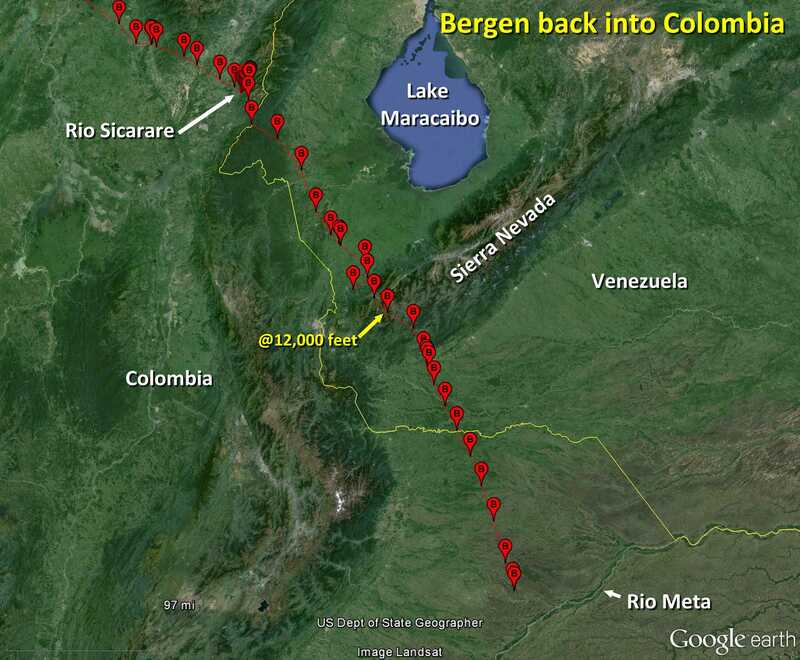 After hanging out along the Rio Sicarare for two weeks, Bergen departed there yesterday and made light work of crossing the mountain range into Venezuela. By 5 pm yesterday, he had moved over a 100 miles SE and is headed towards the northern edge of the Andes, known as the Sierra Nevada. He should be well rested and ready for more exploration. 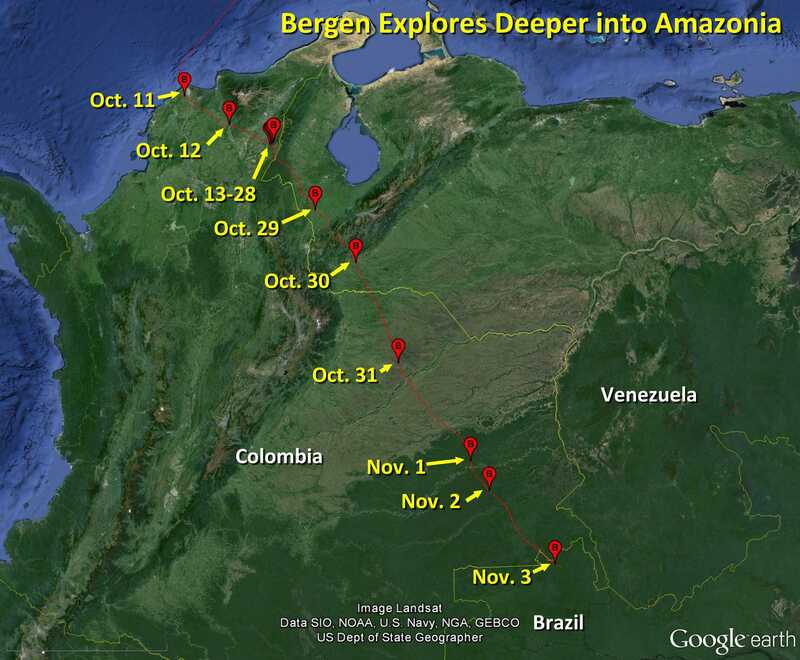 Bergen checked in on schedule from Colombia. He seems very settled on the river – Rio Sicarare. He’s just fishing and perching and moving short distances along the river – boring and uneventful -- just what we want to see from a “settled” Osprey. This photo was taken about five miles downriver from where he is hanging out. 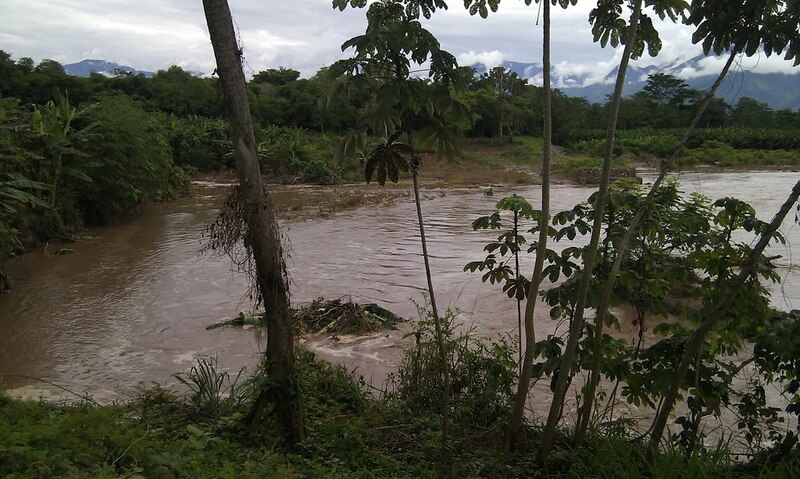 Bergen seems very settled on his river in Colombia. He has been moving up and down the river valley for nine days now. The aerial photos in Google Earth are not very detailed here (Bing has much more recent and detailed images). Now that he’s been here a while I need to find out what the name of the river is. Bergen is enjoying his remote river on the west side of the Cordillera de Perija. 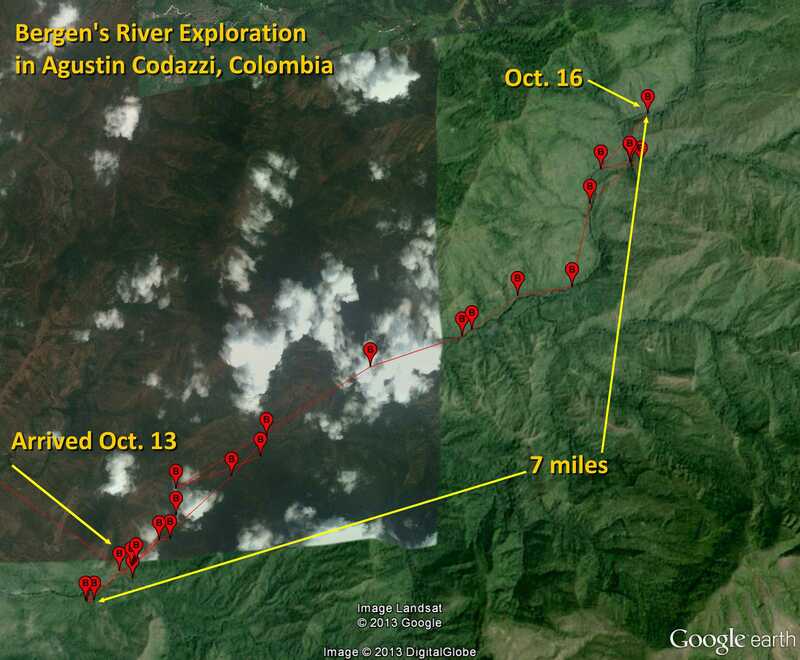 He has moved only about 7 miles since he arrived there on the 13th, but has gained about 1,500 feet in elevation. 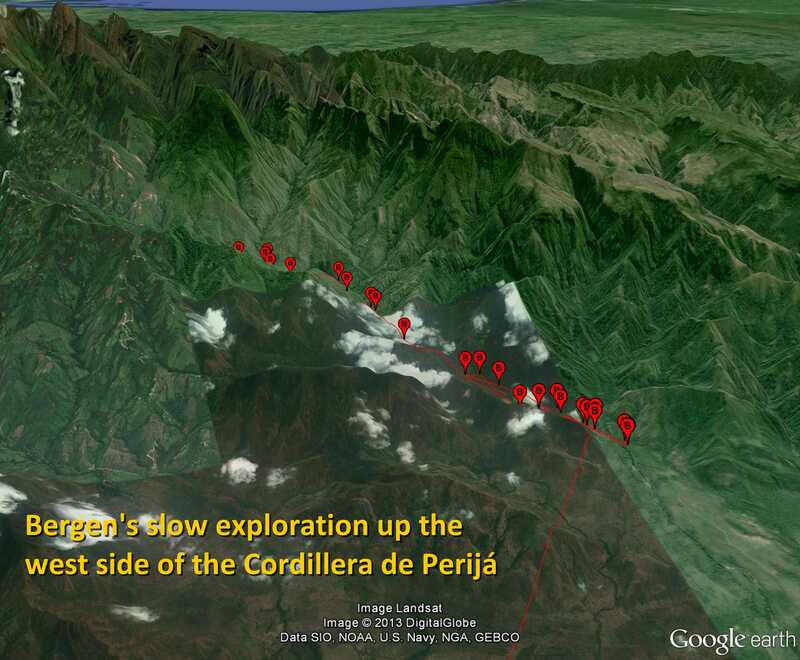 It will be interesting to see if he lingers here (might be a good spot to spend the winter) or keeps going up and over the mountains into Venezuela. The most important thing is that he seems to be doing fine. Bergen and his brother Artoo are now following a similar track – and their paths have crossed multiple times. 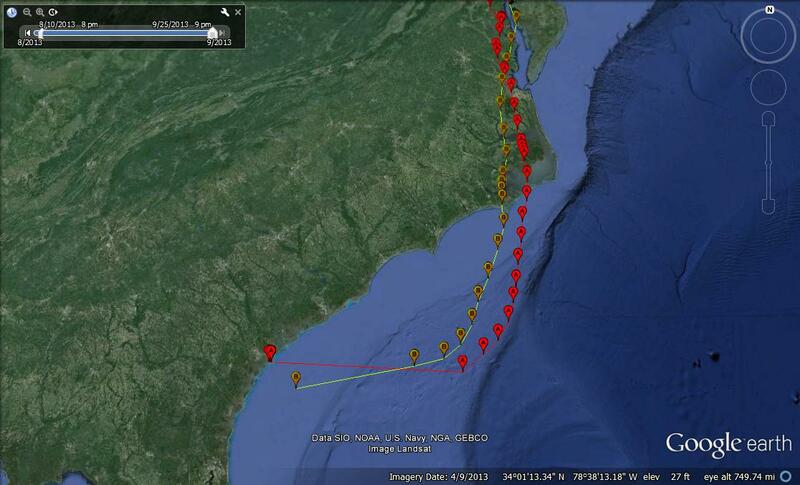 After flying within half a mile of each other on September 23 @ 1pm (after spending weeks apart since Artoo left the nest on August 16), they both took a remarkably similar over-ocean path directly south from the North Carolina coast that night and then looped back to the Georgia coast by early the next morning. 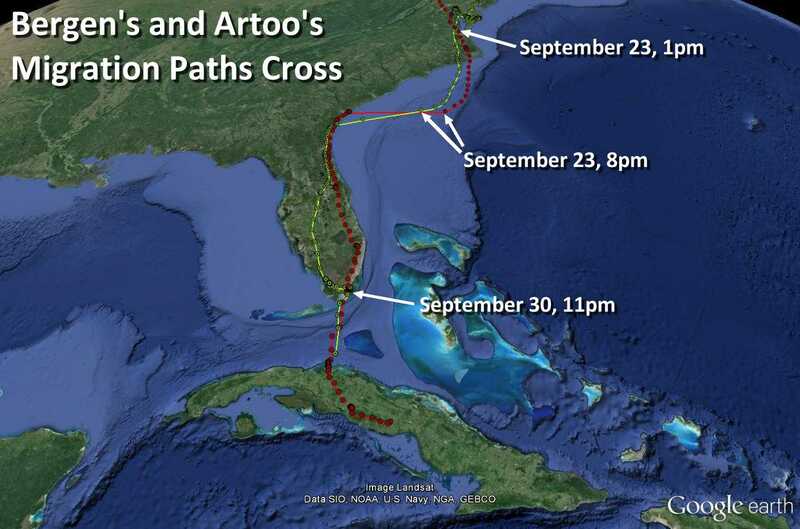 They then separated and followed different paths through Florida, but on September 30, roosted just over 4 miles apart in southern Florida. 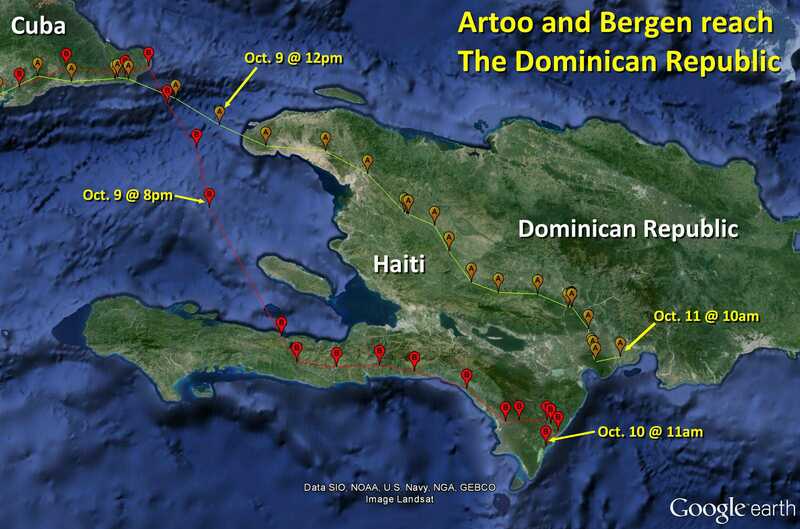 Artoo crossed over to Cuba on October 1 and Bergen followed on October 4. Will they meet up again? Bergen turned west in the night and went back to the coast of Georgia. Phew. Stay over land for as long as possible you silly bird. 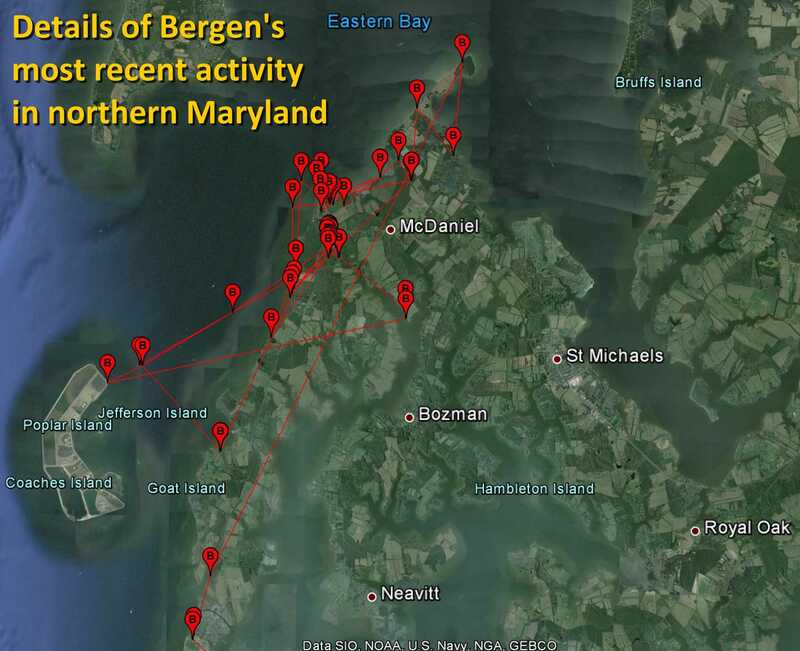 Bergen finally leaves Chesapeake but heads due south and out over open water! Next stop Florida....l hope! More anxiety and gray hair! Bergen is spending a lot of time on Poplar Island which is an interesting and national-acclaimed island/wetland habitat restoration project along the east shore of the Chesapeake Bay. Check out this link to a photo essay about the project: http://www.chesapeakebay.net/blog/post/photo_essay_poplar_island_restoration_brings_critical_habitat_back_to_bay. I’ve been in communication with the USF&W staff and they have noticed Bergen (his antenna gives him away). 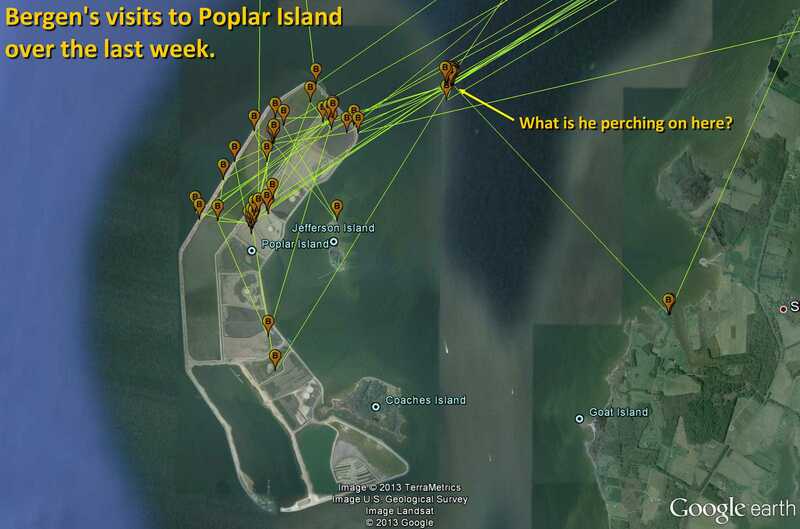 One mystery that was solved by the USF&W guys is what he was perching on out in the open water north-east of the island (see photo). Turns out this is a “pound net” which is a static, shallow water commercial fishing net/trap. There are a couple poles that stick up above the surface of the water. Bergen is obviously checking it out for potential lunch. 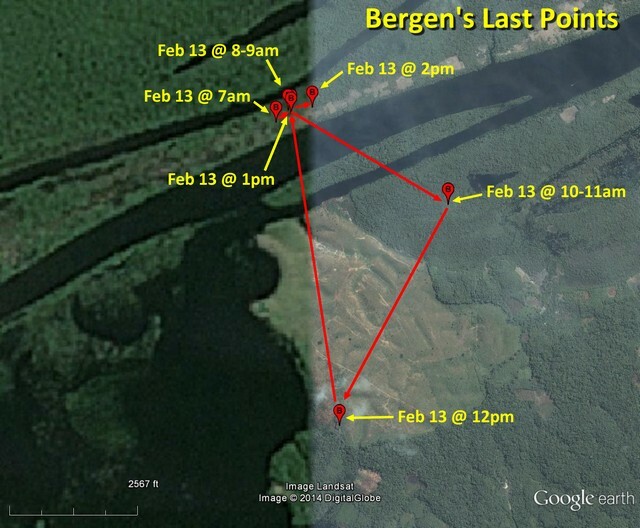 USF&W staff will be out on the island again tomorrow and will try to get some photos of Bergen if they see him. This is a great Osprey haven. They had 22 active Osprey nests on this one small island this year, so Bergen is in good company. The shallow waters around the island are rich with fish. Bergen likes the Delmarva Peninsula. He has obviously found a nice rich feeding ground in northern Maryland. 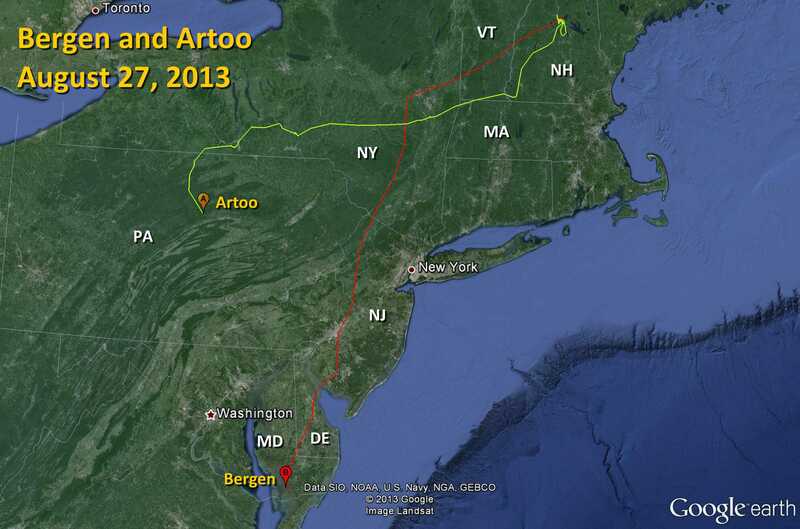 Bergen reached the Chesapeake Bay on August 24, having zipped through VT, NY, NJ, PA and DE. It looked like he was going to cross the Bay on the 25th, but obviously got distracted by saltwater (his first experience of tidal waters and the delicious treats within). He made a three day detour over to the Virginia coast where he explored around Wallops Island, Chincoteague Island and near the Marine Science Consortium (exactly where I was this time last year for a conference. While there, I watched Ospreys fishing in the tidal areas and can confirm that it is a nice place to be an Osprey). By the end of the day on the 28th, he had retraced his steps back to his August 24 arrival point on the Bay. Will he stick around here or continue south? The first map below shows his route (and his brother Artoo’s route) and the second shows his field trip on the Virginia shore. Bergen departed on August 21 and flew west into Vermont. He was on a nice looking lake on the morning of the 22nd. Interesting that he, like his brother has started on a very inland route ... just like their dad. Bergen is Art’s son and Artoo’s brother. He is one of three recently fledged chicks from Art’s nest in Bridgewater. He was caught (along with Art and Artoo) on August 12, 2013. 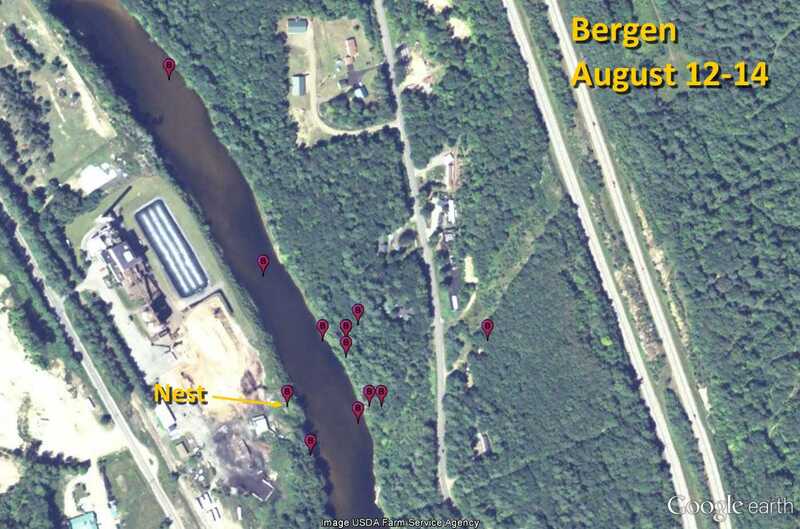 So far Bergen is sticking very close to home and (unlike Artoo) has not strayed far from the nest.